The result of this endorsement has continued to ruin Fiji to this day. 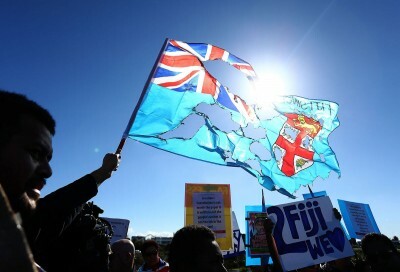 Washington and Canberra have rushed to endorse the bogus election staged in Fiji last month. The vote was dominated by the country’s military, which has held power since staging a coup in 2006, with the FijiFirst Party (FFP) of self-declared Prime Minister Commodore Frank Bainimarama winning 60 percent of the ballot. The major powers are seeking to forge stronger ties with Fiji as a means of undercutting China’s influence in the geo-strategically significant South Pacific state. In reality, the elections were held under conditions of press censorship, severe restrictions on opposition political parties, and military provocations. The day before the vote, the army marched through the streets of the country’s capital, Suva, in a thinly veiled threat of another coup if the election failed to maintain Bainimarama and his cronies in power. A quarter of the government’s parliamentarians, and seven of the appointed cabinet members, are ex-military. Radio New Zealand reported that the army organised a “tea party” after the vote in honour of their former commanders in the regime. Prior to the election, strictures were placed on political parties seeking ballot access. Parties had to obtain 5,000 signatures in 28 days, a large number in a small country with a rural-based population. Out of the 16 parties previously registered, only two were able to gain registration within the initial deadline under the new provisions. Those that failed to gain registration had their assets confiscated. Any party that failed to obtain registration but continued its political activities was liable to an $F50,000 ($US25,640) fine. By the time of the vote, six opposition parties were granted registration, but several leading political figures were still barred from standing. These included former prime ministers Laisenia Qarase and Mahendra Chaudhry, who were barred for previous convictions, on charges that they both allege were politically motivated. The US and Australian support for the Fijian elections and military-dominated government underscores their hypocrisy about human rights and the rule of law, across the South Pacific and internationally. After the 2006 coup, the Western powers imposed sanctions, with Canberra fearing political instability in the region would open the door to Beijing and other countries. This posturing backfired, however, with Bainimarama defying Australian pressure, gaining Chinese aid and investment under his “look north” foreign policy. By 2010, Washington was alarmed over deepening Fiji-China ties, including military agreements that raised the prospect of a future Chinese naval base in the Pacific country. US secretary of state Hillary Clinton met with Fiji’s foreign affairs minister Inoke Kubuabola, signalling an end to Australian-led efforts to force the military regime into submission by isolating it. This shift was driven by the Obama administration’s “pivot to Asia,” which is aimed at ensuring US imperialism’s regional dominance by diplomatically isolating and militarily encircling China. Doing business with the Fijian military government was no obstacle for Washington as it sought to undermine Chinese influence in the South Pacific—a region dominated by the US and its junior ally, Australia, since 1945. Canberra quickly fell in line with the diplomatic about turn. Australian foreign minister Julie Bishop met with Bainimarama at the beginning of the year and announced an end to bans on Fijian regime members, senior military and their families entering Australia. Bishop indicated that a defence cooperation program with Fiji would be restored after the elections. Bainimarama won the vote after plastering his picture all over the country and maintaining firm control of the media. Posturing as a bulwark against the anti-Indian, Fijian chauvinist layers that dominated the previous government under Laisenia Qarase, and promoting limited public spending measures in public transport and education, Bainimarama’s FFP claimed 32 seats in the new 50-seat parliament. The Social Democratic Liberal Party (SODELPA) gained 28 percent of the vote and has 15 seats. It represents the interests of a layer of the chiefly Fijian elite and is led by Teimumu Kepa, a tribal chief who was a minister in Qarase’s government. The National Federation Party, representing the country’s ethnic Indian elite, gained 3 seats with 5.5 percent of the vote. The Fiji Labour Party (FLP) was decimated, only gaining 3.2 percent of the vote and will have no seats in the parliament. The collapse of the FLP vote underscores its loss of any base in the working class. The FLP joined the junta in 2007, with its leader Mahendra Chaudhry serving as finance minister and helping to impose severe austerity measures on working people. Bainimarama has already signalled more mass layoffs of public sector workers, as part of a series of pro-business measures aimed at boosting international investment. The result will be a further escalation of Fiji’s extreme social inequality and levels of poverty.